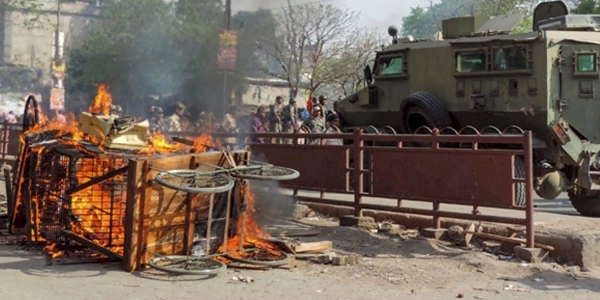 Aurangabad: Aurangabad was the worst affected among the three district, including Kaimur and Gaya, where communal violence broke out on March 25 evening. Rioters set ablaze 31 shops, suggest official figures, but locals say over 50 shops were turned to ashes. More than 25 people were injured and one of the muslim youth was killed. The violence began after crowd of hundreds, as part of the Rama Navami processions – forcibly tried to enter Qazi Muhalla – a Muslim-majority area – at Nawadi Road. The participants of the bike rally tried to make a forced entry into the area. The police said objectionable slogans provoked people of the locality and they asked the participants of the rally not to enter into the area and go ahead passing straight through the market. Following a heated verbal exchange, stone pelting started between the two groups. After the police pacified the two group and dispersed the crowd, people gathered again and took out another procession on March 26. It is interesting to note here that the police gave permission to take out the second rally without taking lessons from the violence during the first procession. It now resulted in large scale damage. Several shops were gutted and property looted. A video shot by a local – accessed by this team – shows hundreds of men violating a Muslim burial ground and proclaiming victory with loud chants of 'Jai Shri Ram' after having pitched a saffron flag there. The violent mob also resorted to firing and allegedly used hand-made bombs but this could not be confirmed. Prohibitory orders under Section 144 of the CrPC were enforced. The situation in the town is tense but completely under control. Over 150 people were arrested in connection with the communal clashes witnessed in the town for two days in Aurangabad and Internet services have been suspended for an indefinite period. People have been arrested in connection with these riots and over a dozen of them are BJP workers, including two senior leaders – Mohan Patwa and Dinesh Kumar Jha. Union minister Ashwini Kumar Choubey’s son Arijit Shashwat, who was jailed on April 1, instigated the violence that erupted in Nathnagar area of Bhagalpur, leaving several persons, including two police personnel, injured because of heavy stone-pelting, arson and exchange of fire. Police officials were biased in arresting, they arrested victims among the Muslim community who report police about the violence taking place. Charges Filed Other details 150 people arrested for rioting.